It’s been way too long since the world was blessed with a Daily Planet album. 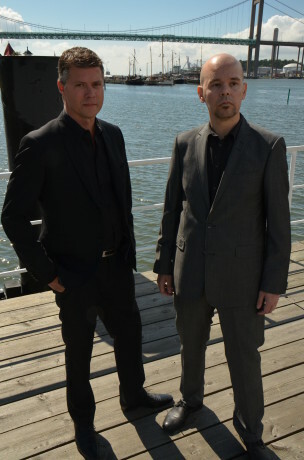 The synthpop duo’s excellent debut album “The Tide” came out as far back as in 1996 and after that the Johan Baeckström and Jarmo Ollila ventured off to other projects like Jarmo’s Mr Jones Machine. This year we finally got first the single “Trust/Fragile” and then the new album “Two”, so I contacted them to find out more about what has happened and what the future holds. They reveal that they are already working on a new album. 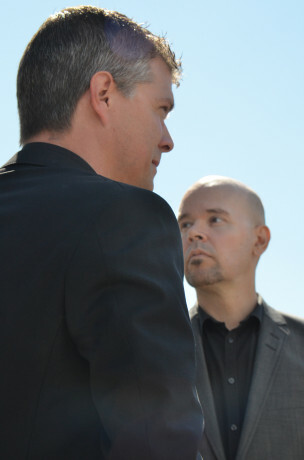 From left to right: Johan and Jarmo. How did Daily Planet begin? I’ve heard rumours about something called U-Men? - We met in a studio in Karlskoga, in 1994, Johan Baeckström explains. Jarmo was there and recorded some music together with a mutual friend that I also worked with at times. I was visiting, and in our conversations we realized how much alike we were regarding what makes a good song. We started writing some material together and thus U-Men was born. - It had been several years since we called it quits with La Vogue, my first synth band that started in 1983, and I was incredibly keen on getting going again. As Johan mentions we met in Karlskoga, where I recorded some solo stuff, and the rest is history. Johan continues to explain the band name. - At our first gig there were people from Energy Rekords, and so we signed to them. The name U-Men was switched to Daily Planet since there were more bands with that (or similar) name. Daily Planet is of course the fictional newspaper where Clark Kent works and “U-Men” is a group of villains from the X-Men world and one of the first EBM classics, by Front 242. It’s been 18 years since the debut album “The Tide”, so of course I had to ask them why they didn’t continue at the time. Johan explains why. - There were many reasons, but the biggest one was that our relationship with Energy Rekords started to crumble pretty early, and we felt that we had to find another label for an eventual follow up to “The Tide”. - To add to this there were also a lot of other stuff that happened back then, with careers, children and other fun stuff that took a lot of time and energy. Time ran away basically. During the intervening years Johan sold all his equipment in order to switch to software and computers, but realized that his creativity died completely with that setup. In the beginning of 2013 he decided to build a new studio, based on “real, analogue hardware”. Creative juices started to flow immediately and plans for a solo project started to take shape. A project that now sits on the backburner since Jarmo and Johan started working together again in October 2013. After that things started moving quickly, with Progress Productions, home to Jarmo’s other band Mr Jones Machine, signing them almost instantly, while recording and writing sped up. - Daily Planet just ebbed out, Jarmo fills in. 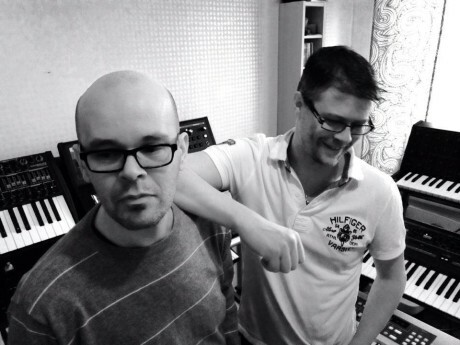 Me and my brother Jouni started Mr Jones Machine together with Magnus Lindström and we have released 3 albums. Towards the end of the 90:s we also released an album with my old band La Vogue that Jouni produced. - For a long time I was anti Facebook and other social media, mainly because of lack of interest and time. Magnus in Mr Jones Machine convinced me to join Facebook, this spectacular phenomenon, so that we could plan a new album with Mr Jones, and keep in contact with Jouni for example. Then I came in contact with Johan again, and the idea to try to do some music together again came quickly. Magnus is to blame for everything! How was it working with each other again? - I was incredibly excited by the thought of making a new Daily Planet album, says Johan. It always felt a bit like unfinished business that we just disappeared after “The Tide”. We’ve worked in the same way as in the 90:s, although we’ve been using email to send files instead of brown envelopes with cassettes. When we met up again in my studio for the first time since 1999, in the beginning of 2014, it actually felt like only a short while since last time. Everything went very smoothly, I think! - Working with Johan was just as good as last time, because we think alike regarding music and have basically the same musical preferences. And he’s a very nice guy as well. It was fun to bring out the guitar to work on melodies, just like we did in the “The Tide” era, and to get complete songs from Johan to work with. My wife Hanna helped out with the lyrics this time, since that’s always been a big problem for me and Johan. I’m also glad that Daniel Bergfalk wanted to mix this album, since he was involved with “The Tide” as well. On the limited edition of “Two” there’s a song that you gave to S.P.O.C.K (“Romulan Ale” – ed), how did that come about, Johan? - I can’t really remember the details, but S.P.O.C.K was looking for new material for an album and turned to us, among others. We presented it to Alexander (Hofman, singer of S.P.O.C.K – ed) who liked it and wrote his own lyrics for it. - I can’t remember either, says Jarmo. The song they got was a song that didn’t quite make it onto “The Tide”. But they made it their own. When asked about what the future holds, Johan says that they’re glad that the album is done, and that they’re really happy with it. They want to play some live shows, and have already started to get some offers. - We are not done with Daily Planet yet, so now we’ll keep going. There are new songs and a clear idea about the sound of the next album.